Calopteryx atrata is a kind of dragonflies, classified in the family Calopterygidae, inhabits by rivers, commonly called ebony Jewelwing in English. The Japanese common name is Haguro Tombo, yet is often mixed up with the other dragonflies in the same family which also inhabit by rivers, so sometime they are called Kawa Tombo or Kawara Tombo, as Kawa (=川) and Kawara (=河原) mean rivers. The length ranges around 60mm*, is rather large in dragonflies. Their characteristic is the ebony wings that have no pterostigma** The color of the body is entirely black, yet the top of the male’s abdominal part is metallic green, and female’s is dark brown. A similar species Calopteryx japonica is resemble to them, also have ebony wings. After the emergence, during their adolescent time, ebony jewelwings inhabit and fly around dim forest until to be matured, then descend to waterside. They do not hover nor soar in the air as the other dragonflies do, but fly slowly and elegantly as if emphasizing on their beautiful wings and the color of the body, make small flapping sound when they take off. The larva’s body reaches 22 to 26 mm in length, is either light brown or light green colored, and rather thin as the other dragonflies’ larvae. *To be precise, the length of abdomen reaches 42 to 52mm (male), 40 to 48mm (female). The hind-wings reaches 35 to 42mm (male), 36 to 44mm (female). **A cell in outer wing of insect, often thickened or colored that stands out from other cells, particularly noticeable in dragonflies. Dragonflies are often invoked as a spiritual symbol in Japan. For instance, the archaic name of Japan Akitsu-shima (=秋津島) originates with Japan’s first emperor Jimmu whom said the Japanese archipelago was comprised of ranges of mountains that seemed dragonflies (=蜻蛉, can be pronounced Akitsu) copulating. 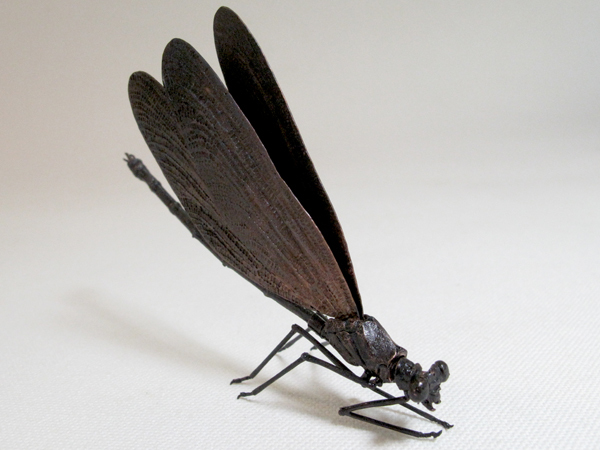 (means victory army bug), thus is from Kojiki (the oldest chronicle in Japan), tells a story that an ebony jewelwing caught a horsefly on a soldier’s arm that protected him from the sting, was supposed that lead his troop’s to a victory. Since this episode, that species have been associated with victory. From the fact that dragonflies move only forward, they are supposed to be auspicious, thereby the figure of them had been adopted to the designs of saddle, stirrup, quiver, and front crest of helmet, etc.. It is said that during Bon Festival (a Japanese custom to honor the spirits of one’s ancestors), one must not catch the dragonflies fly into the house, because that are the spirits. Through the making of this piece, I was feeling like challenging the limit of thinness in metal works creation, due to its slender body. In terms of the wings, I faced with the task to depict the ebony color with slight transparency, yet finally succeeded by a careful sulfuration to make a gradation, supposedly that is quite close to the real one. Likewise, the mechanism that enables the wings to be foldable needed a lot of effort.